Senior Associate Marisa Huber joined Gibson Robb & Lindh in December of 2007. She handles a variety of maritime matters including cases involving yachts, ship repairs, maritime personal injury, maritime products liability, general average, and bunker fuel disputes. Her practice also includes marine insurance coverage, liability defense, bad faith defense, and commercial maritime transactional matters. She combines strong advocacy and analytical skills with a demonstrated passion for the subject matter, and intense dedication to her cases and clients. Ms. Huber enjoys speaking about maritime law in addition to her litigation practice. Presentations include: “When Racing Goes Wrong: Death and Disaster Response in Coastal Waters” together with Gibson Robb & Lindh’s Peter Lindh, Geoff Robb, and Marker Lovell at the Board of Marine Underwriters of San Francisco 2016 Marine Seminar; “Hit By Natural Disaster: Marina and Recreational Boat Liability and Defenses Including Act of God, Salvage, and Wreck Removal" at the 2012 Pacific Admiralty Seminar; “Introduction to Maritime Law: Salvage, Collision and General Average” class session at the University of San Francisco School of Law in 2011; and “Luxury Yachts in Rough Waters: Coverage Issues Surrounding Hostile Situations” dealing with yacht insurance coverage in scenarios such as marine environmental damage, drug smuggling, and piracy at the San Francisco Claims Association Luncheon in November, 2009. 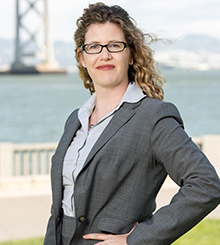 Prior to joining Gibson Robb & Lindh, Ms. Huber served as a full-time judicial extern to the Honorable Jeremy Fogel in the United States District Court for the District of Northern California. She also interned for the U.S. Coast Guard Pacific JAG. Prior to law school, Ms. Huber worked and lived aboard a private megayacht in the Caribbean. Exposed?! The Applicability of U.S. Maritime Law to Foreign Sailors Competing for Foreign Teams in the 34th America's Cup in San Francisco, 2013, 25 U.S.F. Maritime L.J., 209 (Vol. 2, 2012-13). The Legal Implications of an Oil Spill, Bar Association of San Francisco Bulletin, Vol. 3 (February 2008) (co-written with Jennifer Tomlin Sanchez). Ethics Year in Review, 47 Santa Clara L. Rev., 867 (2007).